It is release day for The Dodo Knight, Michelle Rene’s novella about the friendship between Lewis Carroll and his muse Alice Liddell, told from Alice’s point of view. An early Readers’ Favorite review calls it “a wonderful book” – and we couldn’t agree more. You can also ask for it at your library! We love libraries. We’re also running a release month promo! 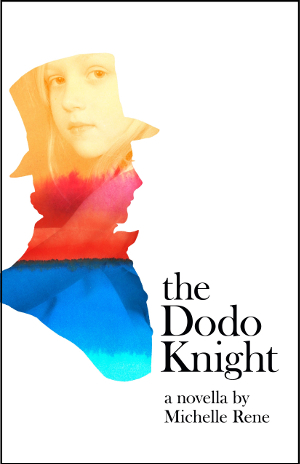 The Dodo Knight is the second Michelle Rene novella we’ve published. Last year, we published Tattoo, a fantasy novella that is a 2018 finalist a Foreword INDIES award. These are two very different novellas… but they are both great stories that with believable, well-drawn characters. So we decided to run a promo to encourage people to read both! Send us a picture of The Dodo Knight (ebook or paperback) or of the receipt for your purchase (be sure to blur out any credit card info!) we will send you a coupon code that will allow you to get the ebook version of Tattoo for just $0.99! The coupon code will be for our GumRoad store. When you buy the ebook there, you get the mobi (Kindle), ePUB, and PDF editions, so you’ll be able to read it on any ereader or print out the PDF and read on paper if you prefer. Even better – the personalized coupon code we send you will be good for THREE uses, so you can share Tattoo with two of your friends. Here are the details: You can share your picture on social media or email it to info@annorlundaenterprises.com. If you share on social media, you can either tag Annorlunda directly (@AnnorlundaInc on Twitter, @annorlundabooks on Facebook) or screenshot the post. Then DM or email us, and we’ll reply with the coupon code. If you email us a picture, you are agreeing that we can share the picture on our social media feeds. If you want to remain anonymous, just tell us how we can refer to you in the post (e.g., “a reader in Tennessee” or “a fiction fan” or something like that). Otherwise, we will assume it is OK to use your first name or your social media handle to refer to you. This promotion will be active until April 30. So grab your copy of The Dodo Knight today – and then share a picture with us to get a discount on Tattoo!